Checking out some other diary entries. I found a few more gems from 1986, I was 13. It's funny, the more diaries I read, the more I realize it snowed a lot back in the '80s. Damn! I remember really enjoying 1986 even though many of my diary entries may not reflect that. It snowed yesterday but all melted. I got an 85 on my science project. The fair was yesterday. Today was Sean's surprise party. The famous Danny from nearly all of my entries. Today was so fun. Kathy came over for my confirmation party. [Ha ha, I just blogged about this the other day - how I wished I had a Bat Mitzvah!] She is so nice. I miss her. I mean we used to be best pals. Serena didn't come. To tell you the truth, I wasn't expecting her. It was good. I made a total of $240 and a dove necklace. I hate school so much. It was about 78 degrees today. I wore shorts after school! The new song by Madonna is on. 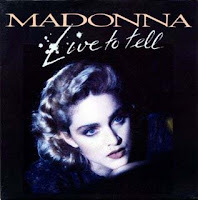 "Live To Tell." My hair looks nice today. I hate Monday, Tuesday, Wednesday, Thursday and Sundays. So cool!!! wish I had some record of EXACTLY what I was thinking and feeling back in my younger years! And just between you and me... I cheat all the time to look skinnier than I really am! Your old friend kind of reminds me of the brother from the original Freaky Friday movie. 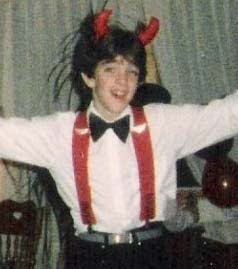 @TS - He was making a funny face, I bet he was singing and we were in costume - it was my Halloween b'day party in 8th grade. Can I just tell you how much I enjoy your blog. Your stories, your diaries...everything...It's such a joy to me when I see in my blog list that you have an update. "Live to Tell" had a great video!!! I love that you share these diary entries with us. I am even more impressed that you still have your diaries! @Ian you are too sweet! @Betty I have always been overweight but really packed on the pounds after I turned 13. The funny thing is I remember weighing 130 in 8th grade and my mom telling me if I never gained another pound that by the time I was older I would be a normal size. If only I had listened to her! I love reading your entries, too...and the weight stuff made me kinda sad. Sorry you had to go through that. Can't wait to read more of your blog! It's so fun. Your entries bring back a lot of memories for me. I loved that Madonna song! Justin Bieber -- Dani's Long Lost Son? Mario Lopez Thinks I'm Terrific! Gym Spy? Mafia Gym Spy? Cheater Decoy?